Pedestrians approach this "non-standard" intersection and request to cross by pressing a standard activation button. The system scans the forklift aisles in all directions for forklift traffic. If the forklift aisles are clear, the system sounds an audible warning and flashes red lights. The forklift crossing arm gates lower, and the pedestrian gates open to allow foot traffic. As soon as the pedestrian gates open the system scans the pedestrian crosswalk. Once no movement has been detected for a preselected amount of time the system initiates the closing sequence. 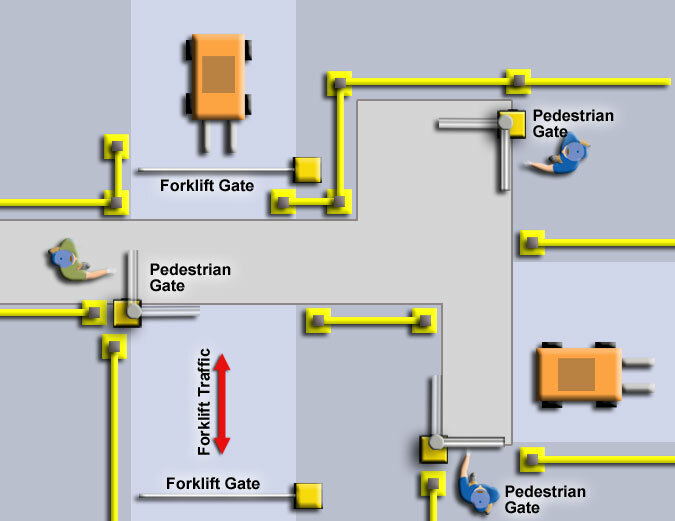 The pedestrian gates close and the crossing arms rise to allow the flow of forklift traffic. 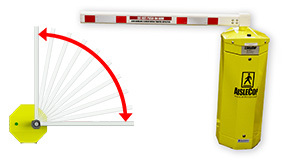 This system may utilize a combination of the following components to help manage a dangerous intersection or aisle. Forklift gates raise and lower as triggered by various processes - the activation of a pedestrian gate, controls via motion detection, pull switches, ground loops, or other methods as needed per application. Steel guard rails are not necessarily part of every forklift safety system, but are frequently used as part of the system to help manage and separate foot and vehicle traffic. Guard rails can be specified from ultra-heavy-duty to simple hand rails, to fit the needs of a particular application. 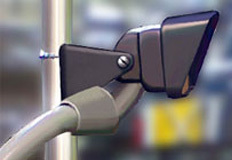 The typical AisleCop® system utilizes motion sensors to detect foot and vehicle traffic. These sensors can be mounted on either the forklift, on pedestrian gates, on walls, on racks, on guard rails, or at other spots as needed to monitor the protected zone. AisleCop® systems are safety tools that help define and control access to forklift aisles. They do not provide 100% protection from industrial traffic accidents. AisleCop® gates do not stop forklifts or other industrial traffic. Other critical factors, such as system maintenance, driver compliance, and pedestrian/individual compliance, enforcement of crossing lanes, and assessment of safe crossings are the responsibility of individuals and companies.